The local government always looks for partners, private or public, individuals or groups, for the realization of its ambitious projects beneficial to the greater majority of the populace. Through the years, the Benguet Electric Cooperative (BENECO) has always been a willing partner of the city in endeavours that benefit the people regardless of the magnitude of the partnership or whatever the cost as long as it will be for the interest of the people living in the city’s 128 barangays. BENECO attempted to bid for the revival of the city-owned Asin mini-hydropower plants hosted by the local government of Tuba to guarantee greater benefits to the people of Baguio, for example, free cost for streetlights around the city, and other benefits that will improve the services of the cooperative and the implementation of the blended computation of rate wherein the availability of renewable energy will definitely play a major factor and thus, lower power costs. Baguio city is lucky because it is the only local government in the country that owns renewable energy plants turned over to the city by the Americans when the Charter of the city was confirmed by the Philippine Commission during its first regular session in the city. However, the city government’s Special Bids and Awards Committee (SBAC) disqualified BENECO from participating in the bidding for the operation of the Asin mini-hydropower plants. The contract of the city with the Aboitiz-owned Hydroelectric Development corporation (HEDCOR) lapsed in 2006. The city’s efforts to operate the plants itself was stopped by the Energy Regulatory Commission (ERC) because the plants failed to have the required certificate of compliance pursuant to the provisions of Republic Act (RA) 9363 or the Electric Power Industry Reform Act (EPIRA) since October 2012 simply because it was not a legitimate cooperative registered with the Cooperative Development Authority (CDA) although it was a recognized cooperative under the National electrification Administration (NEA) pursuant to Presidential Decree (PD0 269. Several years ago, BENECO took over the management and operation of the city’s streetlights while awaiting for the conversion of the streetlight fixtures to the energy-saving Light Emitting Diode (LED) after the local government issued the terms of reference for the conversion of its streetlighting system to LED. 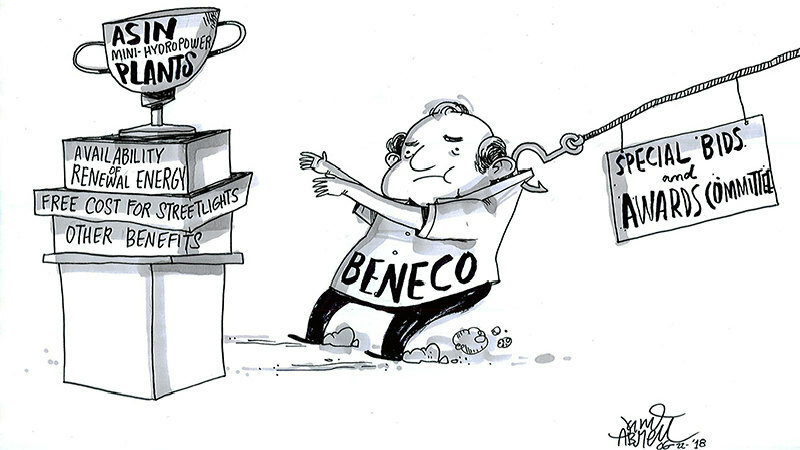 However, the same was never realized by the city to date, thus, BENECO continues to operate a losing venture without guarantee of when it will end. Based on data from BENECO, 70 percent of the daily complaints that they receive are related to streetlights, thus, BENECO personnel greatly attend to the needs of streetlights compared to other pressing concerns that warrant their attention. Recently, BENECO decided to put up a 3-megawatt mini-hydropower plant in Man-asoc, Sebang, Buguias since management decided to venture into renewable energy as part of its long-term initiative to keep power rates low and prevent its possible takeover by private companies. Part of the requirements that must be presented by BENECO to the Bureau of Customs for the release of the units of equipment it purchased overseas is its business permit issued by the local government. Ironically, the said permit cannot be issued because the city government is demanding the cooperative pay over P7 million in business taxes. BENECO has contested this and the issue is now pending with the Energy regulatory Commission (ERC). To fastrack the issuance of the permit, BENECO agreed to deposit in escrow the said amount while awaiting the outcome of the ERC decision on the matter but the city finance committee seems not to recommend the same but they want the same to be paid to the city. We could not understand why the local government continues to make it difficult for BENECO to secure its permit with the available safety nets. If this is the way the local government treats its potential partners in development, there will be no companies that will be interested to pursue partnerships with the city because deals are lopsided in favour of the city only. We should rethink our strategies in development and partnership with our prospective partners in development. It should always be in a give-and-take as we need the support of everyone for us to achieve our desired destination. We should be reminded of the proven saying that ‘no man is an island’ because partnership breaks barriers for the good of everyone. BENECO gave to the city all what it had for the sake of better opportunities for the city to improve on its present standing but it seems the local government was not able to do its part in the equation that is why there seems to be imbalance in the partnership. Let us look forward to better terms and conditions of our dealings with our desired partners. Let us not take advantage of the goodness of one to gain headway that might cause our debacle in the future.